Last Saturday was my monthly poker match. Well, now that I have two monthly games at different locations I don’t really know what to call it. I’ll go with, “First Saturday Game” since it occurs on the first Saturday of every month. We usually start at 1pm but this time we had a late start. Finally, at 330, we started play. Some of the players straggled in late and some of the usual starters didn’t show at all. Oh well, it still turned out to be a great day as we played until 5am. About 2 hours in, an amazing sequence of hands occurred. It was rather odd and peculiar. I’ve been playing poker for 15 years, and, including online play, have never seen such a silly sequence of hands. 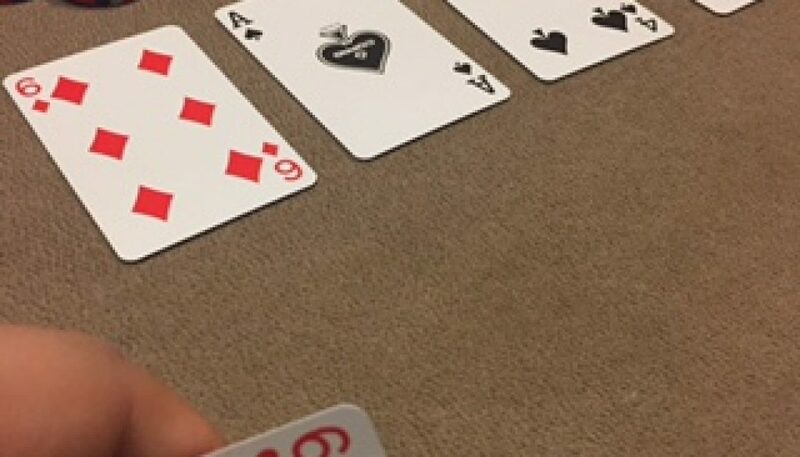 The following three hands occurred back-to-back-back while playing No Limit Holdem. Enjoy. Hand 1: I was dealt K♥ K♦. I put in a raise to 20 and got called in two spots. The flop brought 9♣6♦3♣. I bet 50 and was got min-raised to 100 by a very tight player. I wanted to just fold, but that’s terrible. He only had 200 left so I put it in. He showed 66 for the win, a Set of Sixes. Oh well. Hand 2: I was dealt A♠ J♠. I put in a raise to 20 and got called in two spots. The flop brought J♣ 9♠ 4♥. I bet 40 and was called by one player. The turn was the 6♣ . The player bet out 25 which seemed odd to me. I thought about raising, but after some thought this person doesn’t realize what blocker bets are so he could have J9 or a big draw like T♣8♣. I decided to just call. The river was a Q♣. I beat absolutely nothing now. He checked, and I happily checked. He showed 66, another Set of Sixes. Why did he call the flop? Who knows! Hand 3: Someone raised to 20, I called and another player called. The flop read A♠ T♣ 4♦. Everyone checked. The turn was 6♠. I bet a small amount, the initial raiser called. The river was a 9♥. The raiser bet into me and I raised him to 300, enough to put him all in. He called with Two Pair, Nines and Tens. I showed 6♥6♦, another Set of Sixes, for the win. Wow, I guess the devil wanted to play at our poker game. After those three hands, I went on a silly run and cashed out for a hefty profit. It was the longest I have played in a while; 12 straight hours. Our game broke before the other table, and I decided that I had played enough. We sat around playing Big Deuce (another game which deserves its own post) until the other players were done around 5am. Another great night of poker. Thank you all that participated, and for those that didn’t, maybe next time!